In 1997, after Maëror Tri split up, Stefan and Martin (aka Baraka[H] and Glit[s]ch) decided to continue their collaboration under the moniker of Troum. It was a sad thing to notice that Maëror Tri were no more, but I am so pleased – and I am sure this goes for a worldwide audience as well – that these two guys went on under their new moniker. Troum, which means ‘dream’ in an ancient Germanic tongue, convinced the worldwide audience for sure (including me; I can refer to some reviews I did for them, like the excellent album Acouasme [http://www.concreteweb.be/reviews/troum] or the sublime split with Raison d’Être [http://www.concreteweb.be/reviews/raison-dêtre-troum]). But they have been of huge importance to the international Music scene too. Many acts from all over the world are influenced, or at least inspired, by the Drone / Ambient majesty created by this duo over the last two decades. Anyway, to celebrate their twentieth anniversary, Troum asked some colleague-artists ‘to cover, re-interpretate [sic], re-process, collage, morph’ existing material, to have it gathered under one banner, to offer it as an anniversary gift to the loyal audience. Very soon nineteen (befriended) projects came up with a re-interpretation or a reworked composition, or a new track totally inspired by the party boys. So, all stuff on Transformation Tapes (complete working title actually is: Troum Transformation Tapes: The 20th Anniversary Celebration (1997-2017)) has been created and compiled for this album exclusively. I would call it a tribute too (no reason to disagree), rather than a ‘remix-compilation’. The collection appears via Transgredient Records (not for the first time, as you might know), being a label existing under the protecting wings of mighty Drone Records (once created by Stefan Knappe himself). And it deals with ‘what we all are in the end: a thought, a phantasy, an emotion in the mind of others, a memory, a dream’. A deep thought, an adventurous phantasy, an honest emotion, an everlasting memory, a trespassing dream, I’m sure… Okay, before going deeper into the sonic spectrum of this tribute, first this. As mentioned, nineteen artists are involved, and the result clocks just over two hours and a half (!). There’s a digital version (evidently) and a six-panel digipack double compact disc – the latter coming with a sixteen-page booklet. Allseits ‘Times’ (7:40): Allseits is an outfit by Nina Kernicke, also active as All Sides, and no stranger to Troum, for she co-operated (and still does?) frequently with Troum on live events (which also resulted in the release of, for example, Shutûn). Times is a cold, chilly Drone piece that slowly crawls forth, increasing in intensity and strength, and evolving from that icy basement towards a rich, heavy piece of droning Post-Industrial. Contrastate ‘The Silent Fish’ (5:31): UK-based trio Contrastate (they reformed at the beginning of this decade after a lengthy period of inactivity) have created something new with The Silent Fish, which is based on Grote Mandrenke. The track brings an eerie interpretation of gloomy Dark Ambient with subtle hints of Muzak and a touch of surreal experimentalism. the latter has to do with the additional sounds, vocal samples and, as from the second half, the use of jazzy percussion, psychedelic noises and cosmic sounds. Inade ‘The Innermost Sun’ (5:26): this German duo (the members are also known from Ex.Order) brings a dreamlike version of The Innermost Sun, including a loop taken from Dhanu-H. This is a rich adventure, a cinematic soundtrack with a floating atmosphere. Vance Orchestra ‘Giascei’ (12:33): this duo isn’t active anymore (for quite some time, actually), but they joined forces once more for this tribute album exclusively. Cool (and thank you!)! They come up with a reinterpretation of the self-released Giascei single from 2013. This lengthy piece represents a repetitive and minimal, yet mostly asphyxiating, haunting and obscure sphere, with in a subtle manner a copious range of elements: diverse percussions, electronic loops, dissonant noises and industrialised manipulations. Tarkatak ‘vs_brinnan’ (9:24): this edition of vs_brinnan is a reworked piece by German act Tarkatak. It initially appeared on a compilation in 1999 (from the Lagrimas De Miedo series), by the way. The song has a tribal, ritual and dark-folky character, with tribal percussion, evocative voices and astral sounds. For some reason, it does remind me of the (legendary, at least in my opinion) Aghast-album Hexerei Im Zwielicht Der Finsternis, for what it’s worth. Towards the end, everything turns much more frightening, even claustrophobic, with those shapeless and cluttering noises. Raison d’Être ‘Ananke’ (4:19): this solo-outfit by Peter Andersson does not need any introduction anymore, I think (check out the review for Xibipiio …, the split in between Peter’s most productive project and Troum). Hypnotic, floaty, trespassing dimensions beyond known spaces, this version of Ananke is a majestic piece of transcendental Dark Ambient. Martyn Bates ‘An Untitled Protest’ (5:54): Martyn of Eyeless In Gaza / Twelve Thousand Days fame performs An Untitled Protest with both Troum members involved (Troum professed their dedication to Martyn before). On this comp it is sort of unique, for the track is not a Noise / Ambient / Drone piece, yet a mixture of Post / Neo / Apocalyptic Folk with additional elements of, indeed, Noise, (Dark) Ambient and Drone. Psychedelic Music with a unique twist, Martyn’s song-writing aptitude once again impresses through this diverse track, which contains so many layers and levels. [multer] ‘Sela Saiwala MNX’ (15:40): no strangers to Belgian top-label ConSouling Sounds, [multer] come up with an extended interpretation of Saiwala (Rhythms And Pulsations). Sela Saiwala MNX indeed is build around rhythms and pulsations, first mingling bold droning sounds and a flair of post-apocalyptic Industrial, then evolving by adding lingering ambient soundscapes and industrial noises. QST ‘Kapotte Muziek By Traum’ (6:37): the Dutch duo QST (also active as Quest) cover Troum’s contribution for the Kapotte Muziek series by Staalplaat and Korm Plastics. This remix stands for a semi-danceable reinterpretation, based on electronic beats, techno’ish bleeps, heavy machinery and spacy synth installations. EBM, IDM, Techno of Tunecore, the structure is much more energetic than most other pieces on this tribute-album. Ure Thrall ‘Krypte’ (9:21): one of the (many) outfits that involve Greg Logsdon is Ure Thrall. His contribution is a song taken from the Daur EP, Krypte. Experimental ambience, monumental orchestration, ethereal-droning strings and eerie soundwaves are mingled into an open-minded piece of aural drama and sacral hypnosis. Θ16 vs. Myrrman ‘Sen No 350’ (7:09): Ivan Napreenko of Sal Solaris joins forces with Arnold pR from e.g. Reutoff and Otzepenevshiye, respectively as Θ16 (aka Krugom16) and Myrrman. Both Russian artists bring Sen No 305, a fragment from Sen. It’s harsh, violent, antagonistic. Dynamic electronics in a huge range of forms reveal themselves via Techno-based beats, machinal sequences, Acid-laden constructions, levitating Trance and chill-out Electronica are canalised into one energetic piece of fuzzed-out Dance Music by means of Sen No 350. V.O.S. ‘Breath Again’ (5:32): Veil Of Secrecy aka V.O.S. is a project by Steven Hall (a founding member of legendary Yen Pox). Based on Spirare, Breath Again offers the listener a very intense and dark listening experience. Firm and distressed layers of eldritch melodies create a mostly tormenting composition that is both murky and delicate at the same time. Dual ‘TTN (Ursprung)’ (7:23): I thought Colin Bradley stopped his activities with Dual, but I guess he wanted to pay tribute to Troum by performing TTN (Ursprung) for this special occasion. The track is an up-tempo IDM-laden one, with glitchy beats, floaty soundscapes and astro-melodic waves of lingering nature, carrying your thoughts towards another level of post-human existence (yeah, whatever…). In some way, I do feel some Oriental elegance and that’s nice to experience. Bad Sector ‘Signedumiroir‘ (5:49): the most productive and best-known outfit of Italy’s Massimo Magrini for sure is Bad Sector. Under the Bad Sector flag, Massimo reinterprets Signe Du Miroir from the Acouasme album. The subtle equilibrium in between rich ambiental layers of Dark Drone and sharp, edgy elements from Ritual Noise has been worked out very carefully and meticulously. The addition of industrialised and mechanical details (especially within the second half) supports the gruesome and horrid character of this song’s reinterpretation. Markow C. ‘Chaneism‘ (6:28): Markow C. took care of the mastering of the Transformation Tapes album, but he contributed as well with Chaneism. It starts quite bleak, with those fine additional sea waves at the background, and slowly on it transforms into a doomy yet exotic composition. Cisfinitum ‘Skaun[ei]s‘ (8:24): The Russian Federation houses many great Ambient / Drone artists, but I think that Cisfinitum by Eugene Voronovsky must be one of my most beloved ones (for what this is worth, for there are tens of others that I do adore). Anyway, taken from Harmonies, the first capitel of the Tjukurrpa trilogy, this interpretation of Skaun[ei]s grasps one’s attention by its multi-layered richness. The enchanting lead melody gets supported by different levels of majestic moods, at the same time deeply introvert and shamelessly abundant. Reutoff ‘Hypoxia‘ (10:15): Troum was part (like some other artists involved with this release) of the line-up on the Reutoff tribute album Eidolon (May 2014, Old Europa Cafe) (http://www.concreteweb.be/reviews/various-artists-reutoff-tribute), and now Reutoff reverse their role. They come up with a lengthy reinterpretation of Hypoxia, mingling oppressive droning melodies, lackadaisical ambience and electronic devices. Oh, there is so much to analyse, to dissect, within the first third of this track. After almost four minutes, everything turns more electronic (cf. the energetic beat programming), yet the whole maintains the spiritual and doomed essence. This is the kind of Dark Electro Music that transcends the limitations of more ‘poppy’ Dance Electronics. Moljebka Pvlse ‘Ennoia‘ (8:16): last (but not least) track on Transformation Tapes is Ennoia, brought by Swedish outfit Moljebka Pvlse (Mathias Josefson). This piece, originally released on the Ryna album, starts discordant and frightening by its uncomfortable sound / melody. Yet slowly on, the whole is morphing into a bleak, desolate landscape, lifeless, beyond oblivion. The track withholds a slow transformation in approach, yet the dense, arduous atmosphere only gets heavier and more grievous. Great piece to finalise this remarkable album! Conclusion: this tribute-album is a very diversified collection of compositions by experiences artists that have one thing in common: a deep respect for Troum and their aural magnificence. Although the core is based on Dark Drone Ambient Music in general, the variation showcases the diversity of both the bands being honoured, and the projects involved. 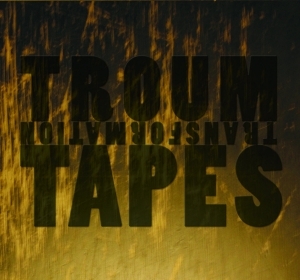 Fans of the birthday boys as well as the scene in a very wide sense will surely adore Troum Transformation Tapes: The 20th Anniversary Celebration (1997-2017). Highly recommended! Up to another twenty years of droning majesty!! !